Looking Toward the Preakness Stakes: Cherry Wine by Casey Laughter- With the Kentucky Derby limelight taken down and owners, trainers, and fans all focusing their attention toward the next jewel of the Triple Crown in the Preakness, there is some new shooters for Kentucky Derby victor Nyquist to hand another defeat to. The Preakness is held in Baltimore, where Nyquist has already shipped to, and will await a potentially full field of rivals to arrive. Cherry Wine continues to look for his breakthrough and eyes the Preakness as the race to do so. 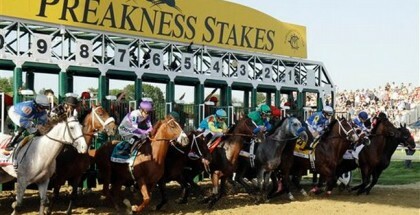 There is one horse that, while entered into the Kentucky Derby as number 22, he was not able to make the race, as all twenty contenders were healthy and able to enter the starting gate. The horse I am referring to is Cherry Wine. Cherry Wine is from the first crop of Paddy O’Prado, who managed to finished third in the Kentucky Derby in 2010, behind Animal Kingdom and Shackleford. While Paddy O’Prado made a name for himself on both the turf and the dirt, he seemed to be a bit better on the turf. This is the contrary for his son. Cherry Wine has shown affinity for both turf and dirt but has done his best running on the dirt. The colt debuted at the historic racecourse but disappointed, finished 9th in his first try, which came over the dirt track. Following that, Cherry Wine went to Churchill for the fall and eventually broke his maiden in his fifth start, coming on a sloppy main track at Churchill Downs, which had originally been scheduled for the turf. The colt followed that win with another before trying stakes competition. He finished 4th in the Rebel Stakes behind Cupid, Whitmore, and Creator. 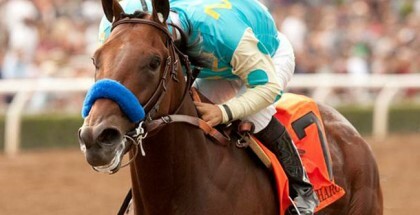 He then finished a closing third in the Blue Grass Stakes at Keeneland. When it comes to the mind of Cherry Wine, Amanda called him “an angel” and “very sweet.” Her working with him likely helped the colt tremendously. However, let’s not forget that he is still a colt and can get excited. 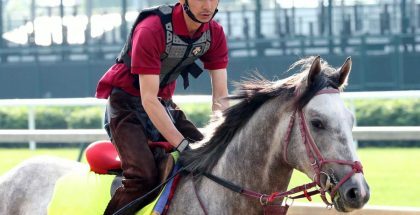 Cherry Wine does have a pedigree that suggests not only being successful on multiple surfaces, but successful as he matures mentally and physically. The colt has yet to really fill out into his massive frame. Gillman commented that he still has a “baby figure to him.” The colt’s sire, Paddy O’Prado ran his best at age three, but was prematurely retired due to an injury sustained in his winning four-year-old debut. Cherry Wine’s dam, C. S. Royce raced for three seasons, as did her sire, Unbridled’s Song. Cherry Wine is likely to get better as time passes. With the Preakness as the immediate goal, Gillman was kind enough to comment on the major goals for the colt this season. With this being said, the colt, should he perform well in the Preakness, could finally indicate he is a major threat in this year’s division. He also has the options of surface. While the switch to turf is not in the current cards, there is possibility. For now, Cherry Wine continues to look for his breakthrough and eyes the Preakness as the race to do so. If he runs well in Baltimore, bigger and better things likely lay ahead of the son of Paddy O’Prado.